I'm Getting Married! What Name Should I Put On My Plane Ticket? I’m Getting Married! What Name Should I Put On My Plane Ticket? 20 Nov I’m Getting Married! What Name Should I Put On My Plane Ticket? 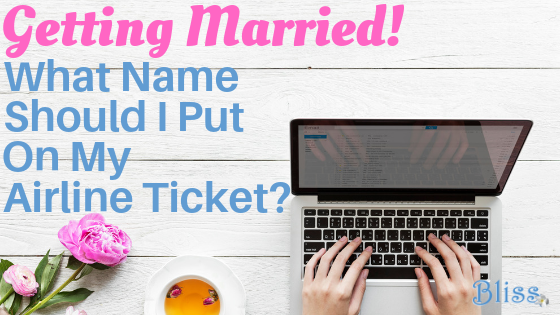 Many brides face this dilemma they approach their wedding and honeymoon: once I’m married, what name do I put on my plane ticket? This question came from one of our real bride clients. Whether you’re getting married, divorced, or angry at your record company and want to change your name to a random symbol a la Prince, changing your name is a legal process. All the friendly folks at the TSA care about is that the name on your passport and your name on your airline ticket match. Your passport most likely has your first name, your middle name, (spelled out rather than just an initial) and your maiden name. So, your plane ticket should be booked in your maiden name as well. It also doesn’t matter if you’ve been married for 5 months, or 5 years. If you’re like Bernie, one of our agents, who never got around to changing her passport after she was married, you can continue to travel under your maiden name until your passport expires. Even if your driver’s license has your new name, again, all that matters is that your passport and your plane ticket match. So remember – your last name doesn’t magically change the minute you get married, so make sure you list your name on your plane ticket the same way it’s listed on your passport! Do you have any other honeymoon planning questions? Email one of our honeymoon experts today! bliss honeymoons reviews, cleveland honeymoon travel agents, columbus ohio honeymoon travel agent, Columbus Ohio travel agents, dream honeymoon, exotic honeymoons, honeymoon planning, honeymoon specialist, honeymoon travel agents, honeymoon travel specialists, legal name on your airline ticket, married or maiden name on my airline ticket?